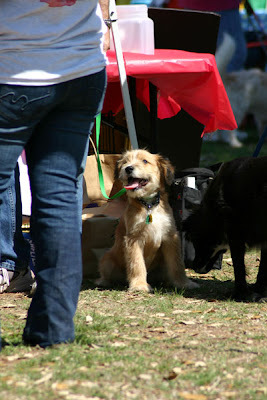 Annie and I attended a doggie festival hosted by the rescue group she's a member of, Austin Dog Alliance. 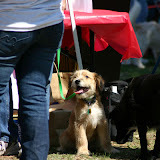 It was a great event, very well attended both by humans and canines. I brought along the camera and snapped a few photos that I thought you might enjoy. This little guy was dressed up for the pet parade costume contest, but he didn't look too thrilled. No one, especially a little fellow, wants to look like a clown, I suppose. 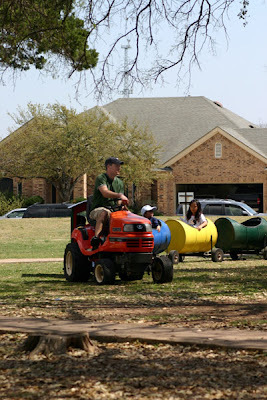 An innovative entrepreneur brought his lawn-mower-powered kiddie train as well, much to the delight of the human puppies in attendance. I loved the bright colors and the thought that you don't have to go to the zoo to get a decent train ride. As a bonus you get a mowed lawn when you're through, too! Finally I caught this photo of the incredibly cute ADA puppy Tramp. I like the way he's half in shadow and half out, wondering what all the hubub is about, but trusting in his human partner to keep him safe. 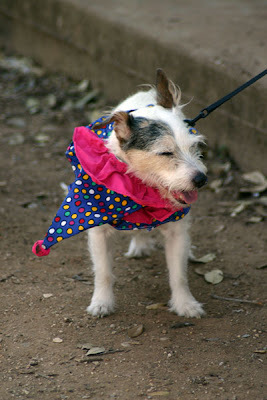 Tramp was the star of the day, no doubt, and hopefully he'll find a great permanent home soon. Well, not too soon, I don't think his foster mom is ready to give him up just yet!